Every church has its various ministries and emphases. However, each congregation functions around five basic areas of ministry as found in the scriptures. They are fellowship, worship, missions, teaching and mercy. While each church involves itself in each of these ministries, a given church may well emphasize some areas over others. It's helpful to prioritize these areas to identify resources which are often limited and focus which can easily be lost. Although there shouldn't be great distance between any area of ministry, Providence Presbyterian Church has ranked them in the following order making us essentially a Worship-Teaching church. God has created us to worship Him. Throughout the Bible this is the essential activity amongst the Covenant community of God's people. The scriptures indicate that worship is the only activity of this life which will continue in the life that is yet to come in Christ. That places an unusual emphasis on worship. Therefore, at Providence Presbyterian Church we take the worship of God very seriously. We seek to make our worship as pleasing to the Lord as possible. We believe only God has the right to decide what pleases Him. Therefore, we seek to follow as closely as possible the guidelines for worship provided in the Bible. We hope our services are characterized by reverence for a holy God and joy expressed from hearts sovereignly redeemed by grace. In a day such as ours when truth is considered to be relative, an objective standard for truth is needed more than ever before. At Providence Presbyterian Church we believe that objective standard is the Bible, the word of God. We not only acknowledge this to be so theologically and intellectually but practically as well. Therefore, we encourage each other to conform our lives according to the teachings of the Bible. That translates into ministry which is Bible centered. We place great emphasis upon the faithful exposition of the scriptures. It is the Bible which drives our lifestyles, our thoughts and our ministries as a church. The central, but not the sole, activity of our worship service is the responsible preaching of the scriptures. Our Sunday School ministry, Sabbath ministries and mid-week ministries are centered around the proclamation of the Bible. It is our source of truth and guide for all we do. 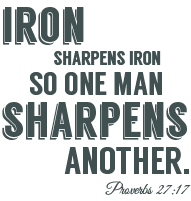 The scripture says, “Iron sharpens iron, so one man sharpens another.” (Proverbs 27:17) At Providence Presbyterian Church we believe this spiritual “sharpening” occurs best in Christian fellowship. The Church of Jesus Christ is a Covenant community which makes it a spiritual family. As such, we seek to spend time with one another as members of that family. This is often done informally amongst the congregation. But we also encourage fellowship in a more organized way. Each week our home fellowship groups meet, one on the eastside of town and another on the westside. These groups consist of a study time followed by sharing and prayer for each other and are usually lead by an Elder of the church. We also have regular fellowship meals and a once-a-month congregational get-together organized by our Fellowship Committee which is just for fun. An outside observer of the early New Covenant Church once remarked, “See how they love one another.” We do. James, the brother of our Lord, states that “this is pure and undefiled religion in the sight of our God and Father, to visit orphans and widows in their distress, and to keep oneself unstained by the world.” (James 1:27) Over and over in the Bible the Church is exhorted to care for the poor and indigent. At Providence Presbyterian Church we wish to take these exhortations seriously. We have an active deaconal ministry for needs both inside our church and outside as well. We try to monitor our people's lives to be able to help in time of providential need. With our post-Communion offerings we support three ministries in the city which reach out to the homeless, the battered and the poor. We periodically organize volunteer groups from within our congregation to help with these works. We are ready to assist with any need as the Lord provides.